WIT, F DE - Nova Africa descriptio. Title : Nova Africa descriptio.. Size : 17.3 x 21.9 inches. / 43.9 x 55.6 cm. 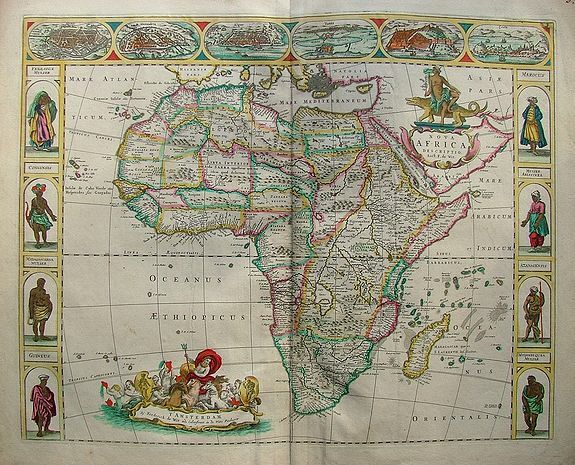 Description :An attracting "carte à figures" map of the African continent. In the top there are six views of: Cairo, Alexandria, Algiers, Tunis, Tangier and Ceuta. At bothe sides there are four figures in national costume of Fezzaica Mulier, Congensis, Madagascaria Mulier and Guineus. It has not been issued in regular atlases, only in composition atlases. Condition : Nice bright colors and print. Split in the centerfold lower part. Wrinkle and spot in the left half in the Ocean above the cartouche.